Conservation medicine is a relatively new field that uses an interdisciplinary approach to study the relationship between ecological, human and animal health. In 2012, CROW’s Board of Directors voted to support the diversification of our mission to include research applicable to conservation and wildlife medicine. As one of the world’s leading wildlife rehabilitation centers, CROW has a responsibility to use the knowledge gained in its hospital to advance wildlife medicine and the “one world, one health” concept. CROW is striving to put the information gained from seeing such a large and diverse patient load to good use by improving the health of the environment, humans, and our pets, through a better knowledge of wildlife health. We are proud to be working cooperatively with a number of scientists and doctors at local, state and national institutions to reach this goal. Furthermore, our clinical research improves the medical and surgical care of wildlife here at CROW, while advancing wildlife medicine throughout the world. All of our research is benevolent “clinical” research, meaning we are collecting information in the normal course of diagnosis and treatment. No animals are harmed in the name of research at CROW. One World, One Health: Working with Lee Health and local Sanibel Scientists, CROW is working to expand preventative care and awareness of issues that impact the health of all. This year’s focus was harmful algal blooms and water quality in general. 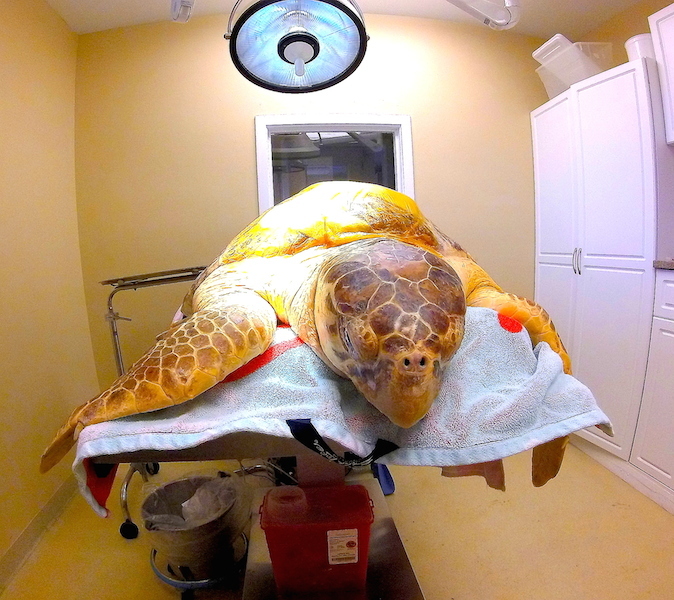 Effectiveness of ILE for treatment of brevetoxicosis in sea turtles: In an ongoing collaborative study with the Loggerhead MarineLife Center in Juno Beach, FL, CROW is exploring new ways to treat sea turtles affected by red tide. Use of ILE as a novel treatment for brevetoxicosis in double-crested cormorants: CROW is currently researching this novel treatment in double-crested cormorants. In 2018, CROW received grants from the National Oceanic & Atmospheric Administration (NOAA) and the Association of Avian Veterinarians (AAV) for this study. Trichomonas survey in eagles: CROW is currently collecting samples for this ongoing study of parasites in bald eagles. Brevetoxin level in tissue and gut samples of stranded sea turtles: In collaboration with the Sanibel Captiva Conservation Foundation (SCCF), CROW is collecting samples from sea turtle patients for further study. Interactive sea turtle stranding map: Also in collaboration with SCCF, CROW has provided data to help create an interactive, real-time map to track sea turtle stranding locations. The map can be viewed by the public on SCCF’s website. Novel treatment for torticollis in raptors: This project seeks to find a better method of treatment for raptors that present with head tilts due to neurologic disease or trauma. Novel treatment for brevetoxicosis in seabirds and sea turtles: Southwest Florida's coastal waters are home to harmful algal blooms known as red tide which causes brevetoxicosis, or red tide poisoning, in wildlife. This study explores a novel treatment that could greatly reduce the amount of time needed for these patients to recover. Coyotes on Sanibel: A collaborative effort to define the number of coyotes on Sanibel in order to determine the best management plan to limit their impact on native and imperiled wildlife species. In May 2017, the Coyote Working Group presented their findings to the Sanibel City Council. Cardiomyopathy in piscivorous birds: This project seeks to establish normal reference ranges for heart size in fish-eating birds and determine the prevalence of heart enlargement in birds in this area. In 2017, CROW also assisted researchers with validating biomarkers for heart disease in birds, determining pathophysiology behind pouch abcesses in pelicans and studying the diversity and prevalence of hemoparasites of wading birds. Diagnostic testing for parvoviral infection in raccoons: This project is validating the best method of testing to determine if young raccoons with diarrhea have canine parvovirus. Cooperative project on mapping the genome of gopher tortoises with Dr. Daniel Vera, Director Center for Genomics and Personalized Medicine at FSU. Cooperative research with Dr. Alec Lindsay at Northern Michigan University on sequencing healthy versus diseased RNA in loons. Etiology of pouch pyoderma in brown pelicans. This is a common problem in pelicans, but the underlying cause has not yet been determined. Incidence of Cyathastoma bronchialis (a worm that occurs in the respiratory system) in double-crested cormorants. This parasite causes coughing, respiratory infections, and sometimes death and has not been previously described in this species. CROW would like to acknowledge our great partners in science and conservation who have been so helpful in supporting the One World, One Health concept that is core to CROW’s mission. We are very excited to be collaborating with so many great individuals and institutions to advance the science of wildlife and conservation medicine.